LAYING EGGS – FULLY AUTOMATED! Two electrical engineering and computer science students at the Hanover University of Applied Sciences came up with a safe and fully automated chicken coop as part of an university project. Two retro-reflective photoelectric sensors, model "RK46C.DXL3/4P" from Leuze electronic, are part of the intelligent automation. Chickens killed by foxes or similar predators are not uncommon. 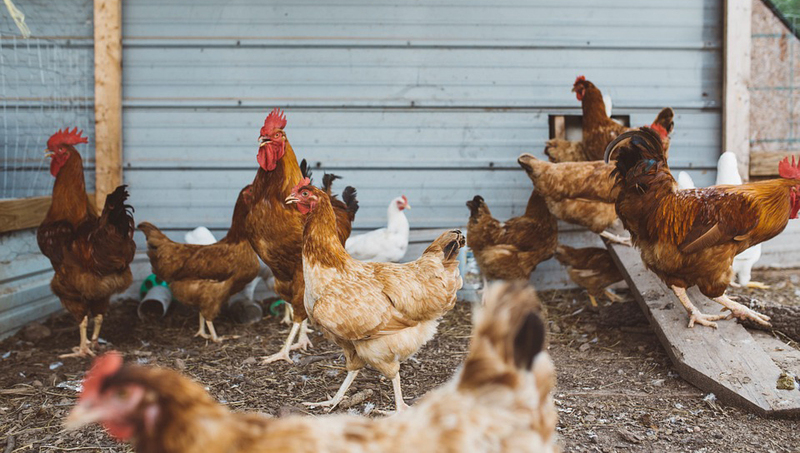 Particularly in rural areas, open chicken coops often pose a real danger to their residents. The two students therefore took it upon themselves to develop a fully automated chicken flap. The requirement: The flap should lock the chicken flap at night but allow the chickens to move freely between the outdoor enclosure and the interior of the coop during the day. This means the flap needed two basic positions: closed at night and open during the day. Two requirements had to be met to close the motorized chicken coop flap at night: for one, it had to be able to detect when it got dark. And the second condition was to detect whether all winged residents had returned to their coop. Once these two requirement are met, the chicken coop is closed fully automatically without any human intervention. Our guinea pigs are named chicken Berta and chicken Lucy. The following happens when Berta meanders from the outdoor enclosure to the interior of the coop: the outer photoelectric sensor detects when Berta walks by the flap. The light-band between the photoelectric sensor and the opposing reflector is interrupted. This information is passed on to the program, which in turn checks whether the interior photoelectric sensor has also triggered. If the answer comes back negative, it means that no chickens have walked outside. The RFID decoder switches on in the next step and reads Berta's unique RFID chip ID. When Berta continues walking to the corridor's interior, she will also interrupt the light-band od the interior sensor and trigger it. The program receives the command to switch Berta's previously read ID to "inside." Thus the chicken is now marked in the program as "in the coop." If the second chicken, Lucy, is also marked as "inside," both of our guinea pigs are inside the coop. For the motorized coop barrier to actually close, the second condition of darkness must also be met. An additional sensor detects the difference between light and darkness. This information is periodically queried from the exterior sensor. So when the exterior light sensor communicates to the program that it is getting dark while Berta and Lucy are inside the coop according to the program, the command is given to close the flap. The two chickens can now get some much needed rest inside the coop without having to worry about being attacked by a fox. When the exterior light sensor detects light in the morning, the command is given to open the flap, allowing the chickens to roam about in the outdoor enclosure until the same process repeats at night.